DUBA — The Louvre Abu Dhabi said Wednesday it will unveil its most prized acquisition on September 18 – a very rare painting attributed to Leonardo da Vinci that was bought for a record US$450 million last year. 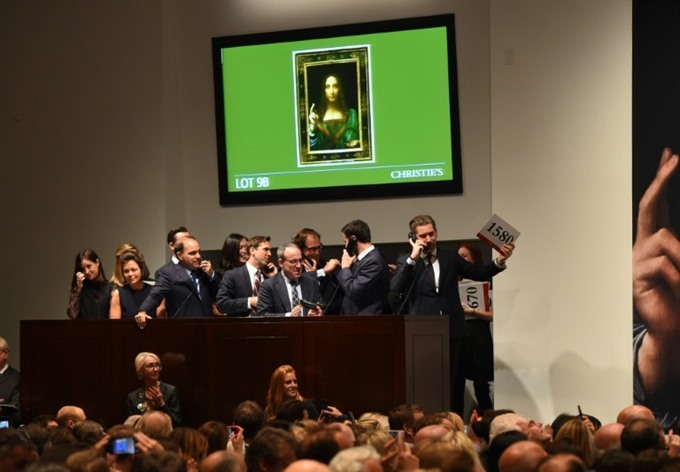 The Salvator Mundi, a portrait of Jesus Christ painted in 1500, was the only one of the fewer than 20 paintings believed to be the work of the famed Renaissance Old Master still in private hands when it went under the hammer at Christie’s in November. It was only six years ago that it was declared authentic after long being dismissed as a copy by one of Da Vinci’s students. "Lost and hidden for so long in private hands, Leonardo Da Vinci’s masterpiece is now our gift to the world," the chairman of Abu Dhabi’s Department of Culture and Tourism, Mohamed Khalifa al-Mubarak, said in a statement announcing the public unveiling. The Louvre Abu Dhabi has kept tight-lipped over the identity of the painting’s buyer, saying only that the emirate’s Department of Culture and Tourism had "acquired" it. Last December, the New York Times identified the buyer as an obscure member of the Saudi royal family, Prince Badr bin Abdullah. The Wall Street Journal later reported Bin Abdullah was acting on behalf of Saudi Arabia’s powerful crown prince, Mohammed bin Salman. He has never confirmed or denied the report. Prince Badr saw his stature rise this month, when he was appointed to head the kingdom’s culture ministry in a government shakeup. Asked by AFP whether the buyer himself would be present for the unveiling, the museum said only that "representatives from Abu Dhabi will welcome the world to the unveiling of the painting".